Though at all times it is fitting to praise the wonders of the Holy Virgin, it would seem that on this day, the penultimate of the Fast of Ss. Peter and Paul, one should rather say a few words on the upcoming Feast. Time enough remains for this, however, in the next few days, when we shall devote ourselves to praising the Apostles’ struggles and virtues, and calling upon their prayers. 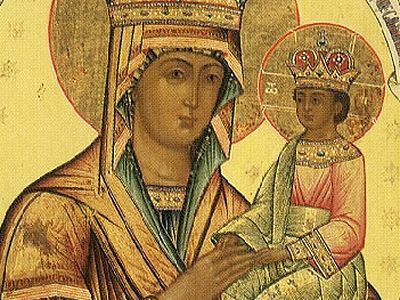 Today let us ponder on the virtues we shall have acquired or failed to acquire when the ascetic struggle of the past six weeks ends at sunset tomorrow, and beg the Most Pure Theotokos to bestow upon us that which we could not acquire for ourselves. This thought occurred to me as, last night, I resumed studying the second homily of St. Gregory Palamas on the Entry of the Theotokos into the Temple. It may seem odd to study such a work at such a time – distant from the feast itself – but I am not reading it for homiletic material to draw from on the festal day (21 November OS), but rather as a succinct yet profound catechism on the spiritual life, and therefore one that bears careful and repeated study throughout the year. 11. In the beginning, when God set the greater light to rule the day, first He made light scattered freely everywhere, then the disc of the sun to receive it (Genesis 1:1-3, 16-18). In the same way, He now displayed His ever-virgin Mother as the lamp-stand of the divine, ineffable light of everything virtuous. Whereas previously goodness had been dispersed among all, later every kind of of virtue was brought together in her in a way past understanding or description, so high had she ascended. All those things which, distributed to the noblest of every age, were sufficient to make them great, and everything which those angels and men who found favor with God were in part, she gathered together. She alone, having brought all these gifts to perfection and multiplied them inexpressibly, pours out abundant grace on those who honor her, also granting that they may reach up to her as the receptacle of great graces, and in her goodness lavishing even more excellent favors upon them. Nor will she cease being mercifully disposed towards all mankind, providing everything beneficial and assisting us plentifully. At the end of a fast, the pious usually sigh with regret over that which we did not accomplish. It strikes us, late as usual, that we have passed on a golden chance freely given, disdained a goblet of grace drunk reluctantly or not at all, missed a turn in the road. Shall we live another year? Shall we see this season of grace again? God alone knows. Even this thought, however, is itself another grace-given moment of salvation, another gracious call from the Lord to repentance, which is, after all, the purpose of any fast. Realizing our utter incapacity for spiritual progress, we must hasten quickly, without hesitation, to her who is the treasury of all the gifts her divine Son wants to give us: We must flee to the Holy Virgin. As St. Gregory Palamas explains so beautifully, the Lord took all of the virtues, gifts, and graces He bestowed on the various saints, and concentrated them to the highest degree in His Most Pure Mother, who indescribably surpasses every created intelligence, visible and invisible, in the degree of her holiness and purity, in her likeness to God. Everything that her Son has by nature, she has by grace, and it is His will, both the will of the All-Holy Trinity from all eternity and His perfect human will in complete accordance with the divine will, that every grace won for us by the Incarnate Economy of her Son be given to us through her mediation. If then, we have fallen short in this fast, let the grace freely flowing through her make up what we lack! If we are oppressed by our weaknesses and threatened by our foes, let us flee to her protection! If we desire the grace of repentance, let us cry out to her with tears! If we desire spiritual gifts, let us freely approach her with the full confidence of children in a most loving mother, one who loves us incomparably more than the very best of all other mothers, and who pleads for us with absolute confidence at the Throne of Mercy, which is the Cross of her Son. She is the Surety of Sinners, the Safe Haven of those in Trouble, the Invincible Champion of the Weak. She will never forsake us. Through her intercessions, may the grace of the upcoming Feasts fill our hearts with joy and our homes with gladness.